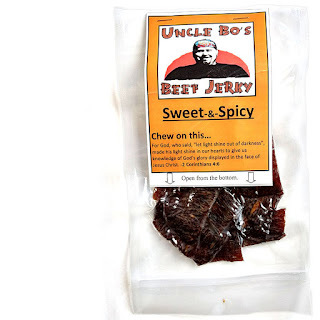 Uncle Bo's Beef Jerky is a brand started by Tim Benton (AKA Uncle Bo), based out of Winter Springs, FL. Benton describes himself as a "native (hillbilly) from West Virginia and a pioneer at heart". 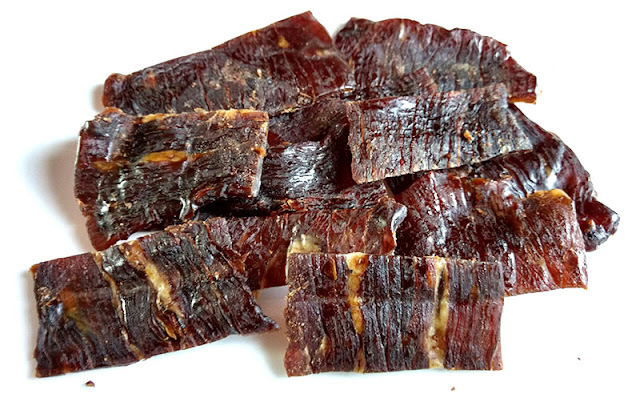 He started making jerky in 1998 after a friend bought him a dehydrator as a gift. After six months of experimenting, he came up with the recipe for his business. Since then, he's made jerky for friends and sold it locally. Last October, Benton launched a Kickstarter campaign to go USDA approved. This "Spiced Just Right" is described by Uncle Bo as being, "A fusion of Spiced Just Right, and Simply Sweet. Just enough Habaneros to tickle the senses and sweetness to calm the heat." The first thing I taste is a light sweet. The touch of salt comes in next. A faint bit of heat begins in the background. The chewing delivers a light natural meat flavor. For being named, "Sweet & Spicy", it holds up somewhat. It's sweet, but not that sweet, and it's spicy, but not that spicy. There's only just enough of the two to warrant the flavor name but not enough to satisfy lovers of sweet and spicy foods. Otherwise, the primary taste profile is a light sweet and light salt, over a touch of seafood and some natural meat flavors. It's quite comparable to the company's, "Classic Original", but with just a hint of chile pepper heat. That heat is still pretty low on our heat scale, registering "mild medium" (level 2 out of 5). The meat consistency is excellent. These are thin-sliced strips cut against the grain, still chewy enough to be jerky, but yet easy enough to snack on without tiring the jaws. They start out chewy, but chew down to something more steak-like. 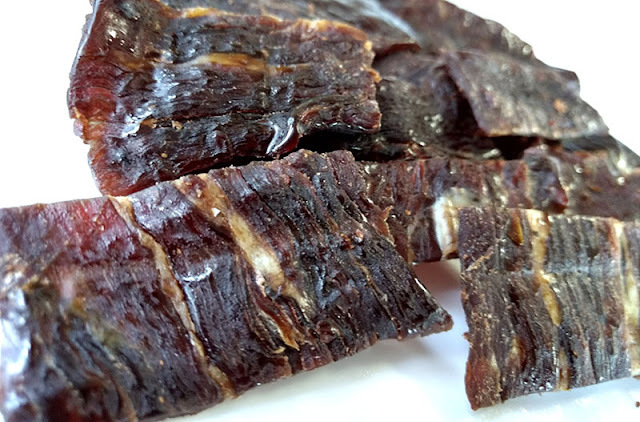 It's a dry jerky, but doesn't chew tough nor crispy. I do see bits of fat here and there, but not too much, encountered only light stringiness. 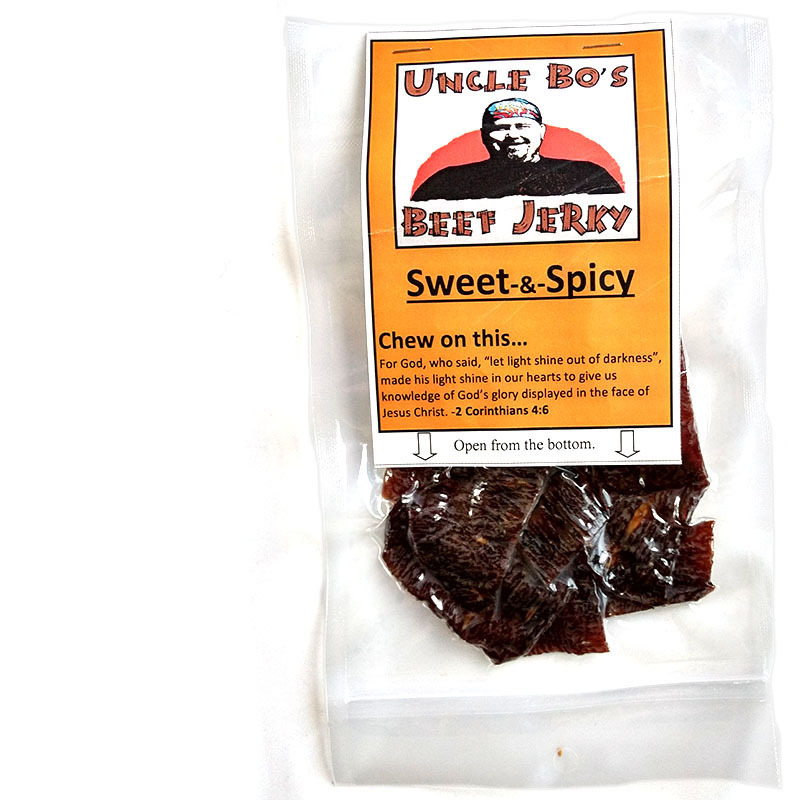 This "Sweet & Spicy" technically delivers on its namesake with a light sweet and a light chile pepper spice, but doesn't give enough to satisfy passionate aficionados of sweet heat. It really needs more sweet and more heat to truly become a champion in this area. It actually tastes too close to the company's Classic Original, and perhaps too close to their "Spiced Just Right"; there needs to be more definition between these three. Yet on its own merits, this Sweet & Spicy is still a snackworthy jerky and still offers a great meat consistency and chewing.